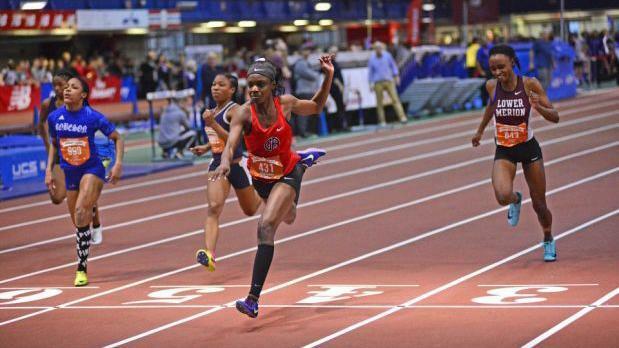 Moforehan Abinusawa holds the overall U.S. No.1 in the 55m, when she ran 6.82 at the Millrose Games in early February. To put that in perspective, American sprinter and Olympic gold medalist English Gardner ran 7.04 in the 55m as a freshman in high school. Abinusawa, a first year student at Germantown Academy in Fort Washington, Pennsylvania, is also the freshman leader in the 60m (7.32), with a second-place finish at the 2019 PTFCA Indoor State Championship. Showing her dominance over the freshmen sprints this season, she won the New Balance Indoor freshman 200m, with a new indoor PR of 24.35.